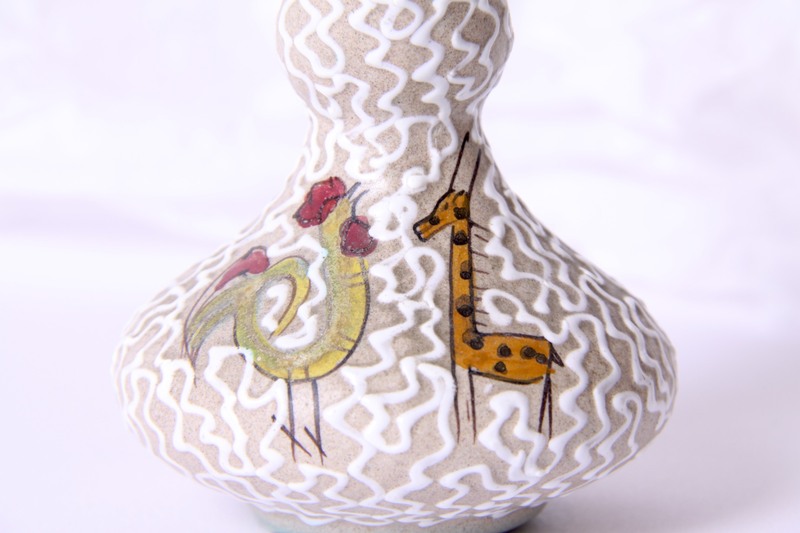 Miniature Italian pottery jug / vase, with Giraffe and Cockerel, made in Deruta, Italy circa 1960’s. This is a Beautiful miniature Italian pottery jug / vase / collectable, made in Deruta, Italy circa 1960’s. 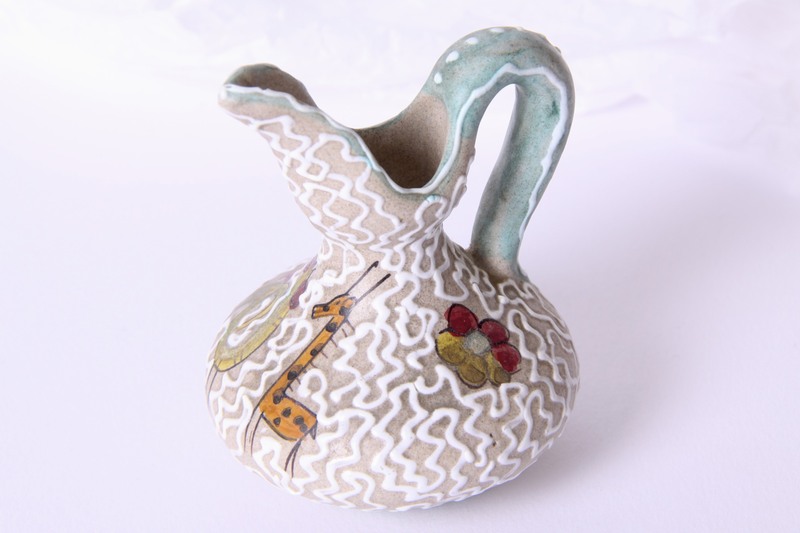 A Wonderful cute and unusual example of Italian Mid Century ceramics, this tiny decorative jug has a lovely exaggerated form, the stone colored body has a pale blue handle. It is ornately / kitschly decorated with images of a flower, leaf, cockerel and a giraffe! With a final zig zagged icing of a white tube lined glaze! Deruta is a town in the Umbria region of Italy, with many small studio potteries that produced pieces in this style, characterised by reddish clay, matte glazes, stylised drawings and white tube lined detailing. Would make a Great addition to any collection of Italian / European / Mid Century pottery, and would complement any retro, vintage, 50’s / 60’s, kitsch, shabby chic interior. In Excellent Condition, no marks, chips or scratches. Handpainted / marked to the base ITALY 3509 . Measures 9 x 7 x 7cm / 3.5 x 2.75 x 2.75in. 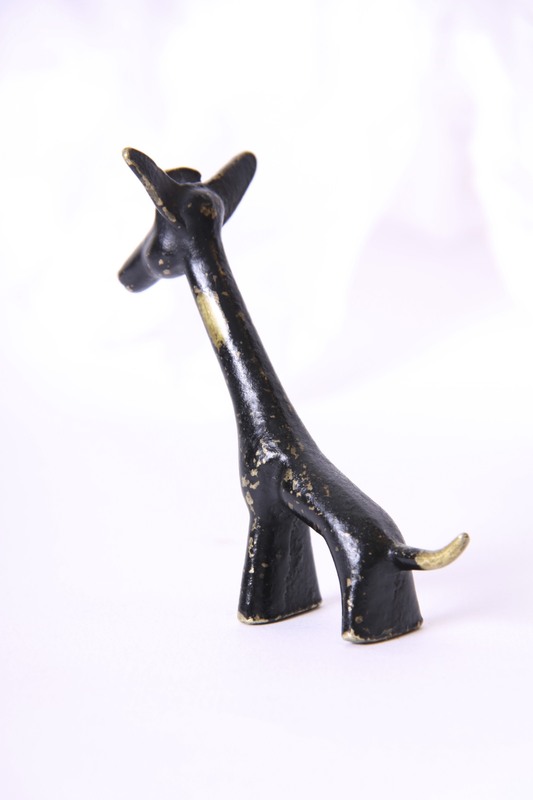 This is a Lovely Walter Bosse brass Giraffe figure, made by Baller, Austria circa 1950’s / 60’s. 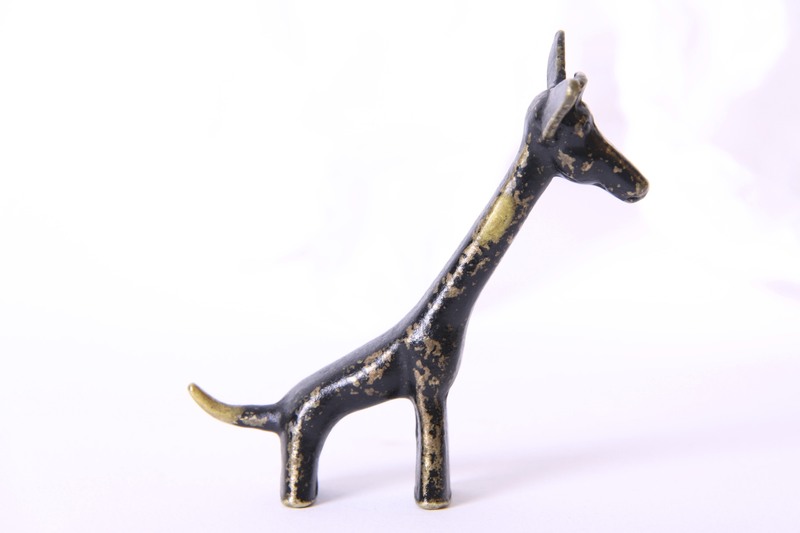 A Classic design of the mid century modern era, the simple stylised cartoon like form of a Giraffe, designed by Walter Bosse a master craftsman and designer of animal figures, during the golden age of Vienna bronzes. From the ‘Black-Golden Line’ series, the miniature brass figurines were given a black finish with polished areas using the ‘Patination’ technique. Would make a Great additon to any collection of Walter Bosse / Baller / Animal / Brass figures. Perfect as a desk accessory / paperweight, or to decorate any vintage sideboard / mantelpiece or coffee table. Vintage Condition, the black patination is very worn, could be stripped to the brass, or repainted.